Find out what your classmates and former professors are up to. David L. Edgell, MPA’70, East Carolina University professor, was awarded the 2014 Board on Human Sciences Lifetime Achievement Award, which honors a nationally recognized leader with significant history of advancing human sciences in higher education. Edgell, who is a professor in ECU’s College of Human Ecology, has devoted much of his career toward promoting tourism as an economic and social development tool for communities and nations worldwide. Sheila G. Gilbert, BA’78, MPA’83, in May 2014, was presented the Distinguished Alumni Service Award by IU School of Liberal Arts at IUPUI for her work with people in need. Gilbert is the national president of the St. Vincent de Paul Society, a charitable organization dedicated to assisting the disadvantaged. She lives in Indianapolis. Donald D. Howell, BS’79, has been selected for inclusion in the 21st edition of The Best Lawyers in America in the areas of insurance law, litigation–insurance, and personal injury litigation–defendants. Howell is managing partner of the Knoxville, Tenn., law firm Frantz, McConnell & Seymour. He lives in Knoxville. Carol S. Johnson, MPA’87, is the author of What Would Florence Do? A Guide for New Nurse Managers, published in November by the American Nurses Association. The book is based on the principles of Florence Nightingale and is designed to help nurses excel in management roles. Johnson has been a practicing nurse for 47 years and works for the American Nurses Credentialing Center as a continuing nursing education accreditation appraiser. Prior to her retirement from hospital nursing in 2011, she was employed as director of clinical excellence and nursing research at Parkview Health in Fort Wayne, Ind. She lives in Fort Wayne. James P. Moloy, BS’81, JD’84, Bose McKinney & Evans attorney, has been selected for inclusion in the publication Best Lawyers in America 2015 in the area of litigation– bankruptcy. He is a partner in the firm’s bankruptcy and creditors’ rights group and has extensive experience representing creditors and debtors in loan workouts and bankruptcy cases. Moloy has participated in complex Chapter 11 cases involving electric utilities, motorsports, transportation and logistics, automotive manufacturing, and steel manufacturing. He lives in Indianapolis. Carl E. Morehouse, MPA’80, in May was elected president for a one-year term to the Southern California Association of Governments. A resident of Ventura, Calif., Morehouse is a city council member and former mayor of the city. SCAG is the largest U.S. metropolitan planning organization, representing six counties, 191 cities, and more than 18 million residents. Chris A. Rosenthal, BS’85, is vice president of compensation, benefits, and corporate services at USG Corporation, a manufacturer of construction materials, based in Chicago. He previously served as the company’s senior vice president of human resources, building systems, and L& W supply, and senior director of compensation and benefits. Rosenthal is responsible for the design and administration of the corporation’s compensation and benefit programs as well as fleet, travel, and office services. Jerald L. White, BS’88, JD’93, has been named a 2014 “Characters Unite” by The USA Network. The awards form part of a multiplatform public service campaign that addresses social injustices and bridges cultural divides. White has been a community advocate for more than 20 years, working as a grassroots organizer, environmental justice attorney, and policymaker with the Sierra Club Legal Defense fund, the City of New Orleans, the U.S. Senate, and the White House Council on Environmental Quality. When White learned about a Louisiana justice of the peace refusing to issue a marriage license to an interracial couple, he launched the New Orleans Loving Festival, a multicultural community celebration and film festival that challenges racism through outreach and education. Under his leadership, the Loving Festival has become an important community anchor for blended families, and a unique platform for showcasing the efforts of artists and community advocates who are working for racial justice. Ten recipients were selected as recipients of the “Characters Unite” awards for their extraordinary efforts in combating hate, intolerance, and discrimination, and making significant contributions to promoting greater tolerance, respect, and acceptance in their communities. Kathleen E. “Katie” Culp, BS’99, MBA’04, was named president of KSM Location Advisors, part of the Katz, Sapper & Miller Network, with offices in Fort Wayne and Indianapolis. Culp began her career at the City of Indianapolis, becoming executive director of the Boone County Economic Development Corporation in 2000. In 2003, she joined The Indy Partnership as director of economic development, moving to Cassidy Turley the next year, where she served as the national leader of the location advisory and incentives practice. Culp joins a 12-person team providing economic development and location advisory services to public and private companies across the United States. Brittany D. Friesner, BAJ’98, MA’11, associate director of the IU Cinema, has served in theater operations at the Sundance Film Festival in Utah each January since 2008. She has also worked for the Tribeca Film Festival, the CMJ Music Marathon and Film Festival, the Bloomington PRIDE Film Festival, and the Seattle and Indianapolis international film festivals. In May 2014, she represented the IU Cinema at the Festival de Cannes in France. Friesner is a former assistant editor of the Indiana University Alumni Magazine. Kristen Meyer Gentry, BS’98, JD’02, was named as one of the office’s partners at Quarles & Brady, a Milwaukee-based law firm that recently opened an office in Indianapolis. She focuses her practice on issues concerning Medicaid and Medicare program reimbursement. Cheryl W. Hall-Russell, BA’92, CERT’97, MA/MPA’99, is president and CEO of Hill House Association, a social outreach organization that focuses on seniors, workforce development, and out-of-school youth, in Pittsburgh. The association is currently opening a charter school for people who have dropped out of high school, so they can complete a high school diploma instead of a GED. Hall-Russell, who previously worked for Indiana Youth Services Association in Indianapolis, was featured as a “Profile in Leadership” in the Pittsburgh Post-Gazette in May 2014. Nicole J. Hollingsworth, BS’95, Golf I-Woman, has served as head women’s golf coach at the University of Toledo for the past 12 years. Among her many achievements, she has coached 23 Women’s Golf Coaches Association All-American Scholars, won 22 team tournament titles, 11 individual tournament titles, and was the recipient of the 2014 Mid-American Conference Coach of the Year Award. Hollingsworth has also coached at the University of Kansas and Ohio University. Olas A. “Chip” Hubbs III, BS’93, MHA’96, was named as the organization’s chairman of the board for the Ohio Hospital Association, which represents 219 hospitals and 13 health systems. Hubbs is president and CEO of Memorial Hospital of Union County in Marysville, Ohio. Another IU alum, Michael D. Abrams, BA’84, MPA’92, serves as president and CEO of the Ohio Hospital Association. He leads a team of 65 associates, supports the 20-member board of trustees, and serves on a variety of healthcare and hospital task forces and committees. Anthony J. Porcorobba, MPA’98, in July 2014, was named vice president of the Bristol, Pa. office of Vacant Property Security, a residential and commercial property company. He provides oversight for the administrative team, managing the billing and client services functions, and enhancing system integration. Porcorobba has been with VPS since 2010 and previously served as VPS’s client services manager, where he oversaw the client relations and billing services team. Sherry Kohlmeyer Seiwert, BS’96, is president of Downtown Indy, an organization that exists to continually improve the downtown area of Indianapolis. She previously worked as executive director for Indiana Housing and Community Development Authority, and as a city of Indianapolis administrator, and program director for Local Initiatives Support Corp.
Megan M. Caldwell, BA/BS’12, has been named a 2014 Health for America Fellowship recipient. One of four fellows, she was chosen from a pool of applicants that included alumni of Brown, Harvard, Columbia, Yale, Stanford, Cornell, MIT, and dozens of other universities across the country. Caldwell was selected based on her experience as a health policy consultant for Booz Allen Hamilton and her demonstrated initiative, leadership, and altruism in the not-for-profit sector. Andrea Sheneman Ciobanu, BGS’04, MPA’06, JD’10, owner and attorney at Ciobanu Law, was named one of MCBA 2015 board members. In January, the Marion County Bar Association, an affiliate of the National Bar Association, the USA’s oldest and largest network of predominantly black attorneys and judges, announced its 2015 executive officers and board of directors. L. Todd Cliborne, AS’00, BS’04, is a lieutenant with the Union Pacific Railroad Police Department and serves as an operations supervisor with the Chicago Division. He is co-founder and an executive board member of the Untouchables Law Enforcement Motorcycle Club, a nationally recognized 501c3 charitable organization dedicated to providing assistance to the widows and children of police officers killed in the line of duty. Cliborne lives in Crown Point, Ind., with his wife and three children. Samuel T. Kooris, BS’09, married Katie A. Horn, BS’09, in New York City in May 2014. The couple met as students at IU. Kooris is a broker at the Rosewood Realty Group, a commercial real estate brokerage in New York City. His wife is an associate in development and marketing at Alchemy Properties, a real estate development firm in New York City, of which her father is the president and founder. Scott C. Lurkins, BS’10, is manager of sales and marketing for the Louisville & Indiana Railroad. He previously served as industrial development director for the Illinois Western Railroad, and as economic development director for the City of Greenville, Ill.
Matthew R. Pierle, CERT’00, BS’00, was named one of eight winners of the PNC Performance Award this past November, the highest honor given to employees of the PNC Financial Services Group. Pierle, who has been with PNC for 13 years, is a credit team leader and heavily involved in the update of underwriting systems within businesses and corporate banking and wealth management. Elizabeth A. “Liska” Radachi, MA’09, and Adam C. Schau, BA’05, MBA’12, of Washington, D.C., were married in Beck Chapel on the IU campus in October 2014. Adam is a strategy and operations manager in international public sector services at Microsoft. Liska is associate director of development in the College of Education at the University of Maryland. Adam is the son of Duane J. Schau, BA’89, who works for IU Bloomington’s Information Technology Services, and Natalia (Browar), BA’89, MA’10. Liska and Natalia both graduated from the School of Public and Environmental Affairs with MA degrees in arts administration. Sarah K. Robb, BA’09, MPA’14, in August, was selected as one of 33 fellows to participate in Challenge Detroit, an urban revitalization program focused on attracting and retaining talent in the Detroit area. During the yearlong program, she will work with partnering host company, Credit Acceptance, an auto finance firm. Robb, who was chosen from a pool of 900 applicants for the program, lives in Detroit. Joshua A. Yelen, CERT’00, BS’01, vice chairman for administration in the Department of Pathology at the University of Miami, was named one of “20 under 40” in the Miami Herald in 2011. The newspaper, which recognizes the top 20 business and civic leaders under 40 years of age in South Florida, recently featured Yelen again, following up and that the class of 2011 is doing today. Yep, he's one of ours! In April, nearly 15 years after Matthew Sullivan, BSPH ’01, graduated, SPEA’s Alumni Board of Directors voted to make his grandfather an honorary alumnus. And at 89 years old, Myron Rukes didn’t just add to the SPEA network – he also brought the average age of the alumni base up by a few points. Their story starts in 1997, the summer before Sullivan’s junior year at IU. A diving accident left him with several broken vertebrae in his neck, suddenly a quadriplegic able to move his arms and neck, but unable to use his legs or hands. Sullivan was forced to suspend his studies and move back home to Terre Haute. After completing some intensive physical therapy and adjusting to what he calls his “new normal” in a wheelchair, Sullivan enrolled in a few classes at nearby Indiana State University. Even though living away from home was no longer an option, he was determined to complete the degree that he had started at SPEA. As soon as Rukes heard that his grandson was interested returning to Bloomington, he offered to drive Sullivan to and from campus to attend classes. Rukes drove Sullivan the 120-mile round trip from Terre Haute to Bloomington five days a week for two years, making it possible for Sullivan to graduate from SPEA with a bachelor’s degree in health administration in 2001. His selfless dedication to his grandson’s education prompted the SPEA Alumni Board to honor Sullivan’s request to make Rukes an honorary alum. “You will never find a more dedicated, hard-working, ‘nose-to-the-grindstone,’ huge in stature, humble in nature man,” Sullivan said of his grandfather. College was never an option for Rukes, a retired pipefitter (which, his family was quick to note, is not to be confused with a boilermaker) and WWII veteran, who served as a Navy Seaman 1st Class from 1944 to 1946. Rukes made the most of his time waiting for Sullivan by wandering around campus and enjoying the scenery. He spent many afternoons in the Herman B Wells library with a cup of coffee, reading the newspaper. Rukes would also sneak into the back of his grandson’s classrooms and listen in. This happened so often that professors started to joke that Rukes should be the one earning the degree. Their jokes became reality in April when the pair once again made the 60-mile trek southeast across highway 46 to Bloomington, this time accompanied by a caravan of family members, so that Rukes could be celebrated as an honorary SPEA alumnus. Kathy Koehler, MPA ’98, vice president of the SPEA Alumni Association Board, greeted Rukes and Sullivan, and joined administrators, faculty, and current students who hosted a small ceremony in the SPEA Dean’s Conference Room, where Rukes was bestowed a certificate from the SPEA Alumni Association Board. Their story touched the students who attended the ceremony. “It was amazing to meet individuals as strong and dedicated as Matthew and his grandfather and really made me appreciate my own health and life in general,” Bridget Barry, BSHMP’15, said. While his grandfather now holds a certificate, Sullivan recently started an energy management services business. He still lives in Terre Haute, and he still spends his basketball seasons cheering for the Hoosiers alongside his grandfather. 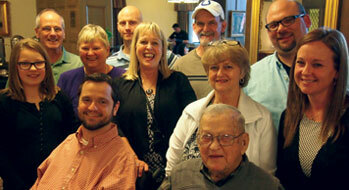 SPEA acknowledges the IU Alumni Association for assistance in compiling Class Notes. You can get involved in a number of ways, including making a monetary donation, joining the SPEA Alumni Association, submitting an update in the form of a class note, or even nominating yourself to serve on a board.